Celebrate your child with this gorgeous photo wrapper. 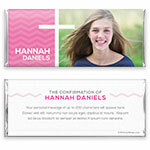 Design: Chevron pattern with white cross and large photo. Personalization: Front name personalization, with back title and message. Recommended Photo Size: 994 W x 769 H pixels.